I love my garden, filled with trees that provide welcome filtered shade along with flowering shrubs. While my garden gives me joy, it does take maintenance to keep it healthy and looking its best. The primary maintenance chore I have is pruning, which I enjoy doing. What I don’t like is cleaning up the clippings, and I often ask my kids to drag them to the trash can or the curb for bulk pickup. However, that was then, and I have a new tool to help me with dealing with the aftermath of pruning. My new Troy-Bilt Chipper Shredder will take the stems and small branches and shred them into mulch. *As a brand ambassador, I was provided the CS4295 Chipper Shredder free of charge, for my honest review. The chipper shredder has two areas where you can insert plant material. The top part is called the ‘hopper’ and is where stems and branches that are less than the width of pencil are added, which are pulverized into mulch that is expelled into a white bag attached off to the side. Branches under 2-inches in diameter are fed through the ‘chipper chute’ and are expelled into the collection bag. It was fun to use and I was pleased how quickly my pile of branches was decreasing in size. In the end, my two large piles were reduced to a much smaller pile of shredded leaves and stems. Instead of throwing out piles of plant clippings, I now have great material for my compost pile. It is also suitable to use as mulch for putting around my plants. However, you’ll want to age the mulch for 3 – 6 months before applying or it can use up the nitrogen that plants need while it breaks down. This photo says it all. My Troy-Bilt Chipper Shredder took two piles of branches, that would have filled up most of my trash can, and reduced them to a small pile of mulch suitable for my garden. *Disclosure: As a Troy-Bilt brand ambassador, the chipper shredder was provided to me at no cost by TroyBilt to review for my honest opinion. Do you have a lawn? I do. My son enjoys spending time outdoors playing football or soccer on the backyard lawn while my grandson likes to run barefoot on it. Maintaining a lawn does take work including fertilizing it twice a year. My warm-season lawn is bermuda grass, which needs fertilizer in spring and the fall. Grass needs nutrients, like nitrogen for its health and to look its best. When it comes to choosing a type of fertilizer, I select organic fertilizers versus synthetic ones whenever possible. Why choose an organic fertilizer rather than a synthetic fertilizer, you may ask? Their effects last longer, they come natural (renewable) sources, they won’t kill beneficial microorganisms in the soil, and won’t harm the environment. Applying the fertilizer was easy using our spreader – you can also use a hand-spreader if that’s what you have. Two weeks later, my lawn looked vibrant and healthy, making the perfect backdrop for my daughter’s wedding. The grass won’t need any other fertilizer until October, just before it goes dormant. It may seem strange to fertilize just before the grass goes to sleep for the winter, but it is recommended as the grass stores up the nutrients, which enables it to green up more quickly the following spring. You can read more about BioFlora Dry Crumbles and other products here. *Disclosure: I was given BioFlora Dry Crumbles, free of charge, in return for my honest review. A summer lawn adds beauty to outdoor spaces while helping to lower air temperatures, which assists in providing a welcome respite from the heat. We have all seen expanses of lush, green grass that are thriving as well as lawns that are struggling and look the worse for wear. Having a flourishing patch of grass doesn’t have to be difficult, but there are guidelines to follow to ensure that your lawn provides you enjoyment and not an eyesore. My career as a horticulturist began on golf courses, and my landscape at home has always had an area of grass for my kids to play on. Over the years, I’ve followed 5 tips for a healthy summer lawn that keeps it attractive without being a slave to its upkeep. Proper watering is vital to keeping your grass happy. Each spring, check for broken or leaking sprinkler heads and make any needed repairs. Make sure that the sprinkler heads are pointing in the right direction (you want to water the grass and not the sidewalk). In summer, water three times a week to a depth of 6 inches – you can check the how deep the water penetrates with a screwdriver. The best time to water is very early morning – it’s important to avoid watering during the day when much of the water is lost to evaporation before it even touches the grass. 2. Fertilize twice a year. A typical lawn is made up of thousands of individual grass plants growing together in close quarters, and because of this, the soil can’t provide enough nutrients for them to do their best. Providing them supplemental nutrients (mostly nitrogen) is required for a flourishing lawn. The first application of fertilizer should occur in spring, as the grass begins to turn green. In fall, fertilize again, which will allow the grass to store up nutrients and enabling them to green up faster the following spring. There are two forms of lawn fertilizer – synthetic (of chemical origin) and organic. I prefer using organic fertilizer as it improves the soil and lasts longer than synthetic. 3. Mow every 4 – 5 days. One of the most helpful things you can do to improve the condition of your lawn is to mow it regularly taking care not to remove more than 1/3 the total height. This helps keep your grass thick and lush while shading the bottom, which will help keep weeds from becoming established. If you have bermudagrass, as I have, it should be maintained at 3/4 to 1 & 1/2 inches high. 4. Dump the leaf bag and allow grass clippings to fall to the ground. The days of hauling the leaf bag to the trash can are over. While most lawn mowers come with a leaf bag attachment, your grass will be healthier if you never use it. Grass clippings decompose quickly when left on the lawn and release nitrogen back into the soil in the process, which benefits your lawn. 5. Aerate your lawn every 2-3 years. Over time, the soil that your grass grows in can become compacted from foot traffic and often is found in lawns that people and pets walk on. The signs of compacted grass areas show up as bare patches with hard dirt that water has trouble penetrating. Compacted soils are bad for grass and other plants because it is hard for water to penetrate and there low amounts of oxygen around the roots. Aerating takes little cores of soil out of the lawn, allowing water and oxygen to penetrate, which results in significant improvement. The best time to aerate is in late spring and can be done by renting an aerator, hiring a lawn care company, or strapping on a pair of aerating shoes for a healthy workout. My grandson, Eric, wanted to trade his toy tractor for my new lawn mower. A good lawn mower is a vital tool in helping to maintain a healthy lawn, and I am having fun using my new TroyBilt 4×4 Self-Propelled Mower. It is quite versatile and is designed to go up and down hills with ease with its front-wheel, rear-wheel, and all wheel drive. Switching drives is easy to do with one hand, leaving the other hand free. Unlike some mowers, this one was easy to start due to its ReadyStart® starting system and 2-pull Starting Promise™. Attention to detail is evident from the ability to directly attach your hose to clean the blade as well as easily adjusting mowing heights. When it came to evaluating this new mower, I asked my husband to try it out as truth be told; he mows our lawn more than I do. He appreciated the attention to detail including the ability to directly attach your hose to clean the deck (underside) as well as easily adjusting mowing heights with a lever. So, if a healthy lawn is one of your landscape goals, follow these 5 tips for a lush green, summer lawn. **Disclosure: This post was sponsored by the folks at Troy-Bilt, and I was given their new 4×4 Self-Propelled Lawn Mower free of charge for my honest review. The English Roses Book Giveaway Winner!
. Thanks to all of you who entered – I enjoyed reading your comments, which clearly illustrated the world’s love affair with this glorious flower and all of the different varieties. Okay, it’s time to get down to business. And the winner is…Crystal Jackson. For those of you who didn’t win, don’t despair. I have another book giveaway coming soon. In the meantime, you can order your own copy of ‘The English Roses’ here. https://www.azplantlady.com/wp-content/uploads/2017/02/Abraham_Darby_English_rose.jpg 1079 1200 arizonaplantlady@gmail.com http://www.azplantlady.com/wp-content/uploads/2018/10/favicon.png arizonaplantlady@gmail.com2017-02-08 15:43:402017-04-25 21:55:02The English Roses Book Giveaway Winner! Today I’m back with more gift ideas for the gardener in your life. As a garden writer and horticulturist, I have the opportunity to view and test many different types of products, free of charge so I can give you my honest review. Some attract my interest right away, while others don’t. Those that I like, I try out myself before I recommend them to others. Fabric Planters are a new concept in pots. They are portable, reusable, washable, and made from recycled water bottles. The colorful choices were what first attracted me to them. The bags come in a variety of colors and sizes including this rectangular one, which is the perfect size for growing herbs or vegetables. My favorite are the mini-herb planters that you can order here. Watering Wands – First of all, I like the description of watering wands because they create a visual picture of plants responding to the ‘magic’ of being watered. Of course, watering wands aren’t new, but the folks at Dramm have put a new spin on irrigating plants by hand with bright colors. They also have a chocolate-brown color option as well. If you haven’t used a watering wand before, they mimic the pattern of rainfall when irrigating plants. This is important since watering straight from a hose tends to result in water running off with little permeating the soil around the roots. Dramm’s watering wand slows down the amount of water so that it can reach the roots without disturbing the soil. It also has an off and on lever for convenience. For those who like color and gardening, this is a great gift idea – I gave a blue one to my daughter for her Michigan garden. To order yours, click here. Spray Nozzle – Keeping with the watering tool theme, there are a variety of ways to water plants and this tool from Dramm takes the standard spray nozzle and kicks it up a notch. Besides the lovely colors, it comes with nine different spray patterns to fulfill whatever need you may have – from watering the vegetable garden, potted plants, or the lawn. Of course, it usefulness isn’t limited to the garden, this spray nozzle has the perfect settings for washing the car, your dog, or whatever else needs a spray of water. Click here to order your own. Compact Hand Pruners – Whenever I am in the garden, I have a pair of hand pruners with me so that I am always prepared to deadhead faded flowers or prune a wayward branch that I always find. However, the problem that I frequently encounter is that my pruners don’t fit easily into my pocket when I need my hands for something else. As a result, I put my pruners down only to have to search for them later when I forget where I put them. Dramm has addressed this problem that affects women most often as their pockets are too small to hold standard-sized pruners. Their compact hand pruners are easily held in the palm of your hand and work very well pruning small branches and perennials. What makes happy is that they fit easily in my back jeans pocket. Of course, the pretty colors are also a plus – I have a purple pair. Of all of the colorful gift ideas I’ve shown you today, this one is my favorite. If you need a great gift idea for the women on your Christmas list (or for yourself), click here to order these pint-sized pruners. I hope that one or more of these garden tools help you find the perfect gift for those on your list. If you are wanting one of these tools for yourself, feel free to send them the link to this blog post for an easy way to buy you the perfect gift. Still looking for gift ideas? Come back in a few days for some of my favorite gardening books. *Disclosure: These products were provided to me free of charge to give my honest review. *This post contains affiliate links for a product that I have used. If you click on the affiliate link and buy the product, I will receive a small commission at no additional cost to you. Affiliate links help to support this site. Thank you for supporting Ramblings From a Desert Garden. The Christmas season is in full swing and if you are like me, you are busy shopping for the perfect gift for that special somebody in your life. My gift list is rather long with five kids, three grandchildren, my husband, siblings, nieces, nephews, and my mother. As a result, quick trips to the store have been inserted into my busy schedule. This includes dropping by the store on date nights with my husband. Whittling down my Christmas list online has become my favorite way of finding special items for loved ones. Just a few minutes sitting at the computer (or on your phone) and you’re done. It turns out that you can buy just about anything online and that is certainly true of items for gardeners in your life. As a horticulturist and garden writer, I get to see a lot of products with a garden theme. So, in anticipation of Christmas and to help you with your shopping list, I am going to feature creative gift ideas, for the next few weeks, for those in your life who like to grow things. and sent me one free of charge for me to review. I’m particularly excited about this gift idea as I enjoy growing herbs throughout the year. I grow herbs outdoors all year in my Arizona garden, but I’ve also grown them indoors on my kitchen windowsill, which is why I was excited to try this all-in-one indoor herb kit. The kit arrives in a very nice rustic, wooden box complete with lid. There are several colors available and I chose the white one. Everything you need is inside the box – plastic planting tray, soil, seeds, plant markers, chalk, and instructions. All you need to supply is water. 1. Add soil to the plastic planting tray. The soil doesn’t completely fill the tray – but not to worry, this is Wonder Soil. 2. Add water to the soil. Immediately, the soil began to expand making sounds like those you hear when you add milk to Rice Krispy cereal – kids would love to watch this stage. As you can see, the soil now reaches to the top of the plastic tray. 3. Plant herb seeds. The kit comes with five packages of herb seeds with enough seeds left over to plant a second crop. You can always plant your own seeds as well. I planted all five varieties of herb seeds, although I must admit that I don’t like cilantro. However, people in my family do, so I planted it. 4. Add plant markers. Popsicle sticks with blackboard paint are a very cute way to identify the newly planted herbs. As I mentioned before, the vintage herb kit includes everything you need, even a stick of chalk. Seeds are planted, plant markers are in, and now it’s time to find the right spot for my new planter. 5. Place in an area where the herbs will receive at least 6 hours of sun. I have a sunny kitchen window which works perfectly. I am looking forward to seeing little green herbs poke up through the soil. Better yet, I can hardly wait to use them to flavor my favorite dishes. If you have someone on your Christmas list who likes to garden or cook with fresh herbs, this would be an excellent gift idea. You can visit their website to see the different options for ordering a vintage herb garden for a loved one or yourself. **Come back soon for more gift ideas for those who love to garden. *This blog post contains affiliate links. If you click through and make a purchase, I may receive a commission (at no additional cost to you). Thanks for your support in this way. asked me to test a recipe from their book, free of charge, for my honest review. My love affair with canning began a few years ago when I made my first batch of jam, under the guidance of my mother and I have never looked back. The inspiration for me wanting to learn how to can food came with the family farm, which had a mini-orchard filled with apple, peach, and plum trees. Since then, I’ve made blackberry, peach, plum, and strawberry jams as well as applesauce. 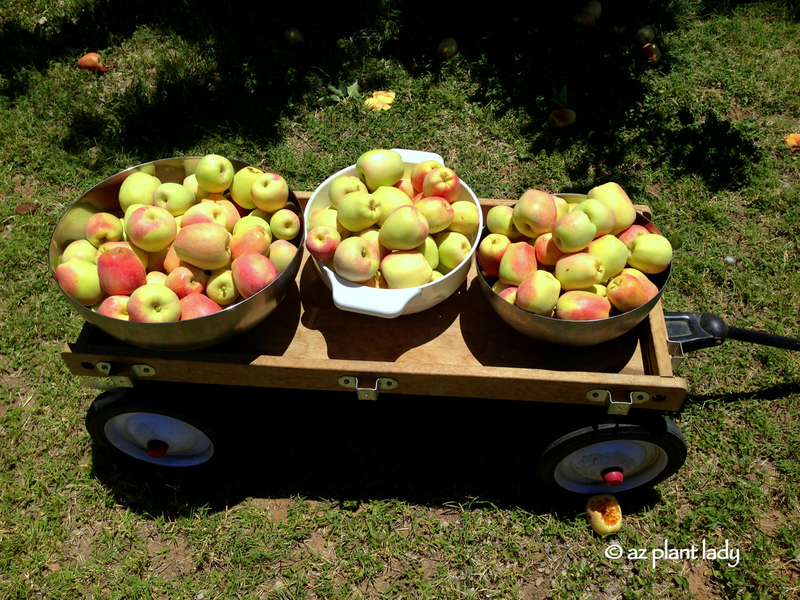 In fact, I enjoyed canning so much, that I planted apple and peach trees in my garden. I must admit that it took me a long time to decide what recipe to choose because all of them were so tempting. Who wouldn’t want to make blueberry-lemon jam, grapefruit marmalade, raspberry-lemonade jam, or vanilla bean-citrus marmalade? In addition to creative jam recipes, there are also many delicious recipes for preserving fruits and vegetables as well as savory selections. In the end, I chose to make a variation of nectarine-sour cherry jam. For this recipe, you could use blueberries, blackberries, raspberries, or even strawberries in place of the sour cherries. Because my husband and kids love blueberries, that’s what I chose. Isn’t the color combination beautiful? As it cooked, the jam mixture began to turn a delicious shade of purple. Once the jam was finished cooking, I poured it into sterilized mason jars and processed it in a boiling water canner. Now, I have seven jars filled with delicious jam for my morning toast. It’s important to note that the cookbook doesn’t have a beginners section for those learning how to can and preserve fruit and vegetables – its focus is more on creative, canning recipes. The equipment needed for canning isn’t expensive or complicated to use. I blogged about my first canning lesson from my mom, when we made peach jam several years ago, that you can read here. I’ve also written about my experience at making applesauce and blackberry jam. How about you? Do you like to can? What is your favorite fruit, meat or vegetable to preserve?